When ACI marinas started sprouting throughout the Adriatic Sea mid-1980s, the idea of organizing a sports manifestation which would gather the most renowned names of world sailing every year at the same time was born. Despite much disbelief, the story truly started on the day when jokes are usually made in the world. In 1987, the news that Rovinj would be frequented by some of the largest names of world sailing truly sounded like a good April Fools’ joke. The 27th America’s Cup finished earlier that year, and that was the oldest world sports competition in history. They sailed in Australia for the first time; that was a closed, exclusive competition of rich people and sailing masters from all around the world, and the media attention was enormous. The claims that Harold Cudmore – the helmsman of the British competitor in the America’s Cup, Hubert Raudaschl – Austrian, legend of Finn class, Swede Pele Peterson, who was, rumor has it, born under sails, or Swiss Pierrè Feklman, the winner of Whitbread round the world regatta, would come to Rovinj did not seem that credible. 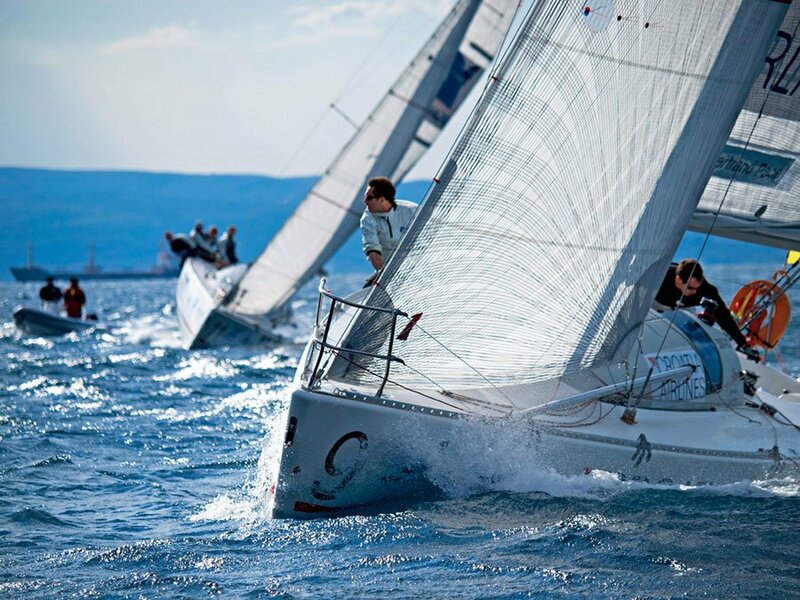 However, to the surprise and admiration of many, the regatta was held, and one year later, the same group of ACI’s aficionados, led by Veljko Barbieri, took it one step further. The New Zealand “sailing wonder,” Chris Dickson, came to Rovinj. The then 26-year-old Dickson was, together with the legendary Dennis Conner, the world’s largest sailing star. The great Peter Gilmour, Australia’s golden boy, also arrived, and the incredible lineup also included the first winner Harold Cudmore, Italian Tomamaso Chieffi, Pele Petterson, Slovenian Dušan Puh and Zvonko Bezić from Rijeka. Chris Dickson won the ACI Cup, and it became clear to all sailing aficionados that great global things were happening in Rovinj. Back then, they sailed on Elan 31. The next sailing star that came to Rovinj was American Paul Cayard. That was in 1989 and 1990, when Cayard celebrated twice in a row. The fleet also changed: they sailed on Danish boats Bianca 107. The participants sailed under the flag of the old state for the last time in Rovinj in 1991. It was then that Russell Coutts, the boy who would write the history of America’s Cup in just a few years, came for the first time from New Zealand. He came out victorious in his first appearance in Rovinj. In 1992, the ACI Cup had already become a name, a competition with tradition, and the first, second and third on the global ladder – Chris Dickson, Peter Gilmour and Russell Coutts – answer the call. That was perhaps the most important year of this fantastic competition. The first one under Croatia’s banner, but never stronger. The first sailor who got the honor of sailing under Croatia’s flag in the ACI Cup was the legendary ship-master from Orebić Branko Pešut. That year, Chris Dickson won the ACI Cup for the second time, and the winning crew included Karlo Kuret, the first Croat who sailed at the America’s Cup. The middle of the nineties spawned the first great hero of the ACI Cup. Since 1993 to 1995, Australian Peter Gilmour celebrates three times in a row. Peter Gilmour becomes the ruler of Rovinj, the ruler of the ACI Cup, and in those years, he leaves Russell Coutts, Roy Hayner, Tommaso Chieffi, Paul Cayard and others behind him.